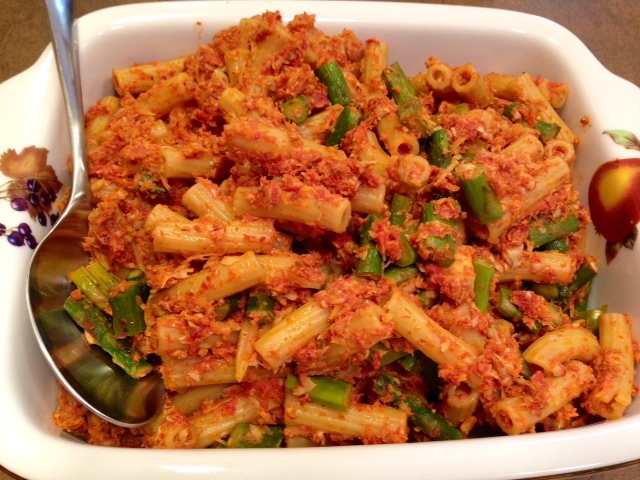 Sun-Dried Tomato & Artichoke Pasta Salad With Roasted Asparagus. This was another dish I made for the baby shower. Pasta salad is always an easy, go-to dish for a party but I wanted to do something a bit different from a classic pasta salad. 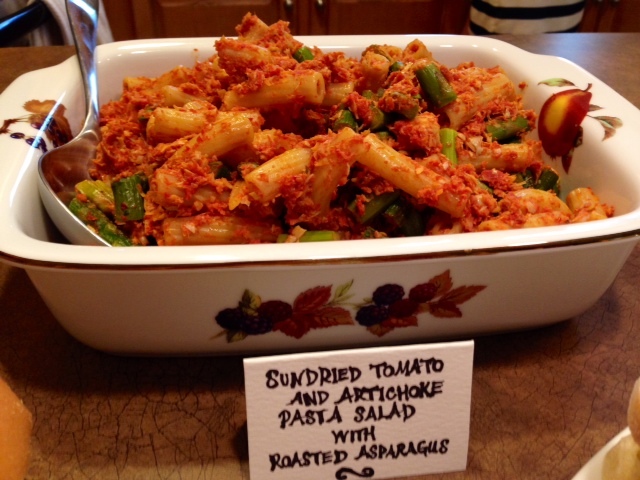 I used sun-dried tomatoes and artichokes to make the sauce and then added some roasted asparagus for a nice crunch. This pasta salad is really delicious and flavorful. 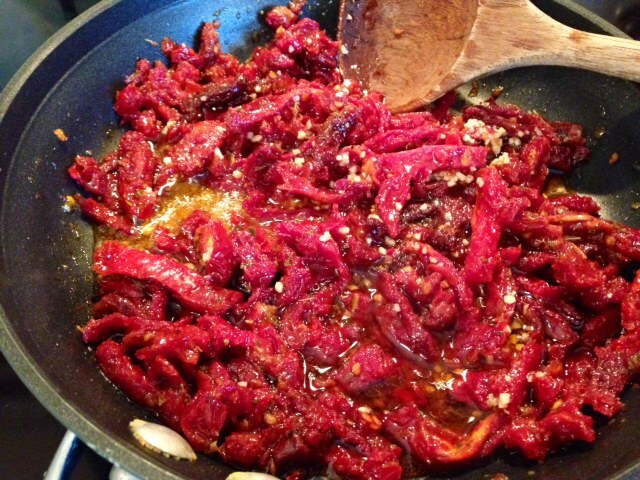 Heat the sun-dried tomatoes on medium heat and stir in the chopped garlic. You won’t need to add any oil because the tomatoes will still be coated in the oil they were in. Heat for about 5 minutes or until the garlic is lightly browned – sun-dried tomatoes can burn easily so keep a close eye on them. Allow this to cool slightly, and then put the mixture into the food processor and blend until smooth. 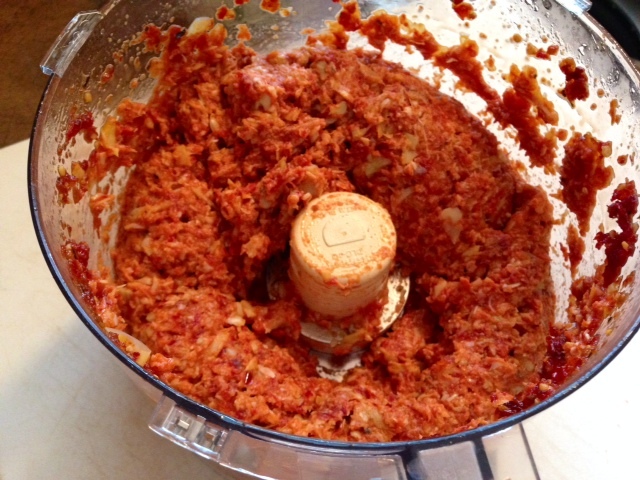 After the sun-dried tomatoes are smooth, add in the artichokes and pulse a few times to do a rough chop of them. 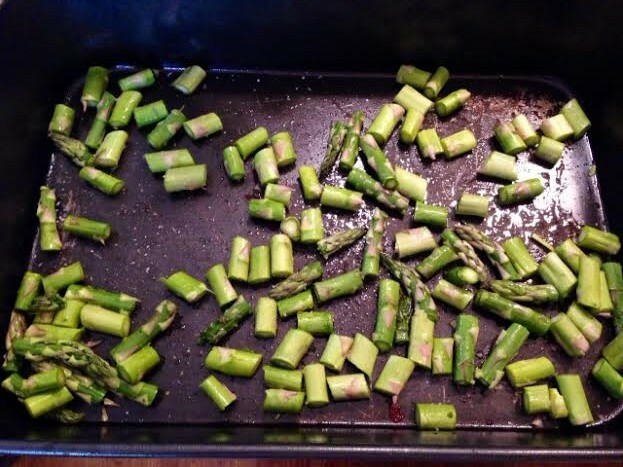 Toss the asparagus in about 2 tbsp of olive oil and roast in a 400 degree oven for about 12 minutes. While the asparagus is roasting, boil the pasta as directed on the package. Drain all excess water and then combine the sun-dried tomato and artichoke mixture into the pasta along with the roasted asparagus and toss well to combine. Season with a dash of salt and black pepper. This pasta can be served hot or room temperature. ← BLT & Caprese Sliders.